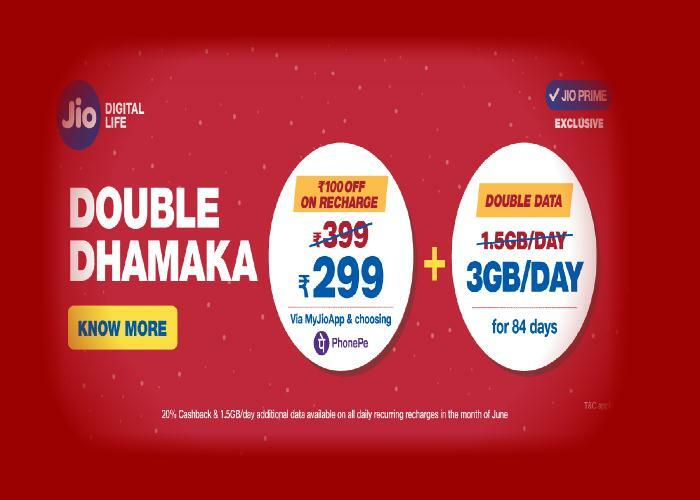 Reliance Jio telecom service Jio has announced a Double Dhamaka offer on recharge packs and discounts up to rupees 100 on every prepaid recharge packs and offers 1.5GB extra data to prepaid customers every day. This discount, for example, can be availed on Jio prepaid recharge plans purchased through its mobile app, MyJio, using digital wallet PhonePe, the telecom company has also decided to offer discounts on purchases made through select modes of digital payments. The discount, Reliance Jio said it is applicable to all customers available From 16.00 hrs 12th June 2018 and will end on 23.59 hrs 30th June 2018. To begin with, you need to be a Jio Prime member to be able to avail the offer. You will need to download MyJio app on your smartphone, and login to the app, thane tap on the second tab at the bottom called Recharge, which will take you another page where you will see all the available plans. There are different plans to choose from, right from the ones that offer 1.5GB daily data to the ones that offer 5GB daily data. Select the one priced above rupees 300 and tap on buy. The payment summary page will already show the discounted price rupees 50 on MyJio app. Then the remaining rupees 50 discount can be availed when you make a payment using PhonePe wallet. In case you don’t have one, you can download the PhonePe app from the Google Play Store, and create an account. In short, you get a total of rupees 100 off when you recharge using MyJio app and pay using PhonePe wallet. After making a recharge under Jio Double Dhamaka offer, you will get 1.5GB extra data on a daily basis. Plans priced at rupees 149, 349, 399 and 449 offer 1.5GB daily data, and they will now offer 3GB in total. The rupees 198, 398, 448 and 498 plans offer 2GB daily data, and they will now offer 3.5GB daily data. The rupees 299 plan that offers 3GB daily data will now offer 4.5GB data on a daily basis. The rupees 509 plan offers 4GB daily data, and it will now offer 5.5GB data on a daily basis. At last, the rupees 799 plan which offers 5GB daily data will now offer 6.5GB daily data. It is important to note that the validity of respective plans remains the same.